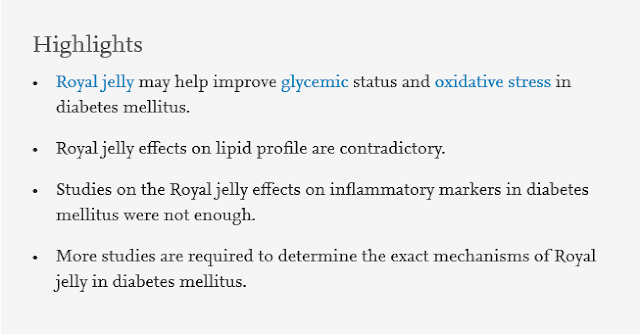 Effects of Royal jelly on metabolic variables in diabetes mellitus: A systematic review. Diabetes mellitus is one of the most common endocrine disorders in the world. This systematic review was conducted with focus on the current knowledge on the effect of royal jelly on metabolic variables in diabetes mellitus. PubMed, Scopus, Embase, ProQuest and Google Scholar databases were searched from inception until June 2018. All clinical trials and animal studies that evaluated the effects of royal jelly on diabetes mellitus, and were published in English-language journals were eligible. Studies that provided insufficient outcomes were excluded. Out of 522 articles found in the search, only twelve articles were eligible for analysis. Seven studies showed a significant reduction in FBS, and one reported HbA1c decrease following royal jelly supplementation. Although royal jelly supplementation resulted in significant reductions in HOM A-I R in three studies, the findings on insulin levels were controversial. In addition, royal jelly substantially improved serum levels of triglycerides, cholesterol, HDL, LDL, VLDL and Apo-A1 in diabetes mellitus. In addition, royal jelly resulted in a decrease oxidative stress indicators and increase antioxidant enzymes levels. In conclusion, royal jelly could improve glycemic status, lipid profiles and oxidative stress in diabetes mellitus. However, exploring the underlying mechanisms warrants further studies.